Yesterday, I was able to abort - completely stop - a migraine by using the Spring TMS device and no medications So, today, I want to say that I'm very thankful for the device and to eNeura for developing it and doing the work to get it approved by the FDA. This is so very important to me. Triptans are risky for me because of a history of heart attack, but my blood pressure jumps into stroke range when I have a migraine, and that's risky too. So, for years now, whenever I get a migraine, I've been forced to choose between two risky options. The Spring TMS device has been stopping about 80 percent of my migraines with no medications, sparing me from having to choose riskier options. So, I'm beyond thankful for the device and so very relieved to have safer treatment. While I'm expressing my thanks for the Spring, I also need to express my thanks for all the wonderful people from eNeura who are involved with the Spring. They're a phenomenally dedicated crew who truly want to help patients with migraine. They've trained nurses to take calls from patients who have questions. They've even gone so far as to have people who will help patients who are having problems getting their insurance companies to cover the device. They're personable, knowledgeable, professional, dedicated, and hopeful. Thank you! With Thanksgiving later this month, migraine or not, most of us dive into holiday planning as deeply as we're able to. Holidays have become so commercialized that the original reasons for them often seem to be overshadowed. So, between now and January, 2016, we're saying, "Yes," to our readers who asked us to repeat last year's feature project - Thankful Despite Migraine. 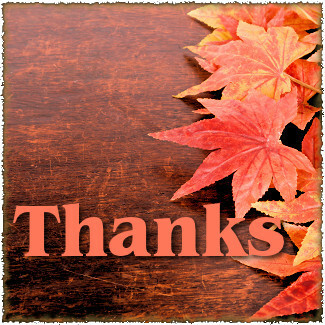 We'll be sharing the people in our lives for whom we're thankful as well as things, events, and more.